This is a twist on your classic hamburger. A delicious salmon burger topped with crunchy greens and a big slice of pineapple. Salmon is a great source of omega fatty acids, so we are giving you a new way to cook up your favorite fish. 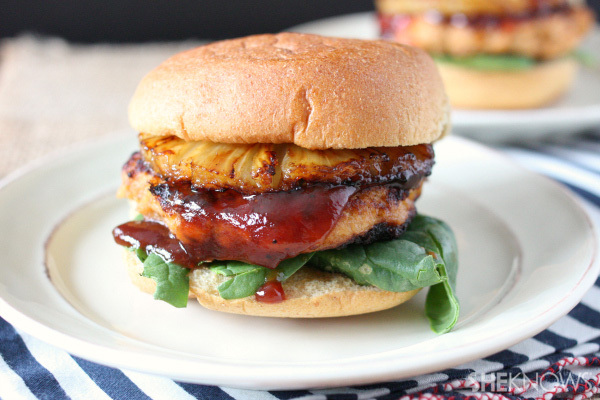 We created healthy salmon patty burgers and topped them with grilled pineapple, sweet barbecue sauce and fresh baby spinach. This is not your average big mouth burger. In a medium bowl, mix together salmon, eggs, panko, barbecue sauce, mayonnaise, salt, pepper, lemon juice and lemon zest. Form into 4 large patties or 8 slider-size patties. Add 2 tablespoons olive oil to a pan set over medium heat. Once the oil is hot, add in salmon patties and cook until browned on each side. Add a salmon patty to a bun and top with grilled pineapple ring, baby spinach leaves and an extra drizzle of chipotle orange barbecue sauce. In a small bowl, mix together all ingredients and keep refrigerated until ready to use.